A good friend, Sandy Bambi from Grateful Dreads Salon (who did the AAAAMAZING hair for my collection in Detroit Design Festival last year) commissioned me to custom make a tutu that she wanted to give as a gift for a friend who is a ballerina. 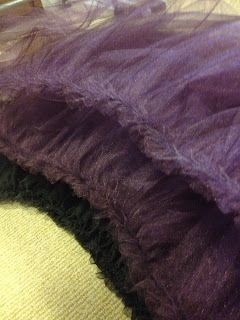 Her requests were - purple, black, and VERY big, poufy "stage ready". I was pretty excited about this one, and since i'm no stranger to making tutus, I decided to take a few photo of the process. 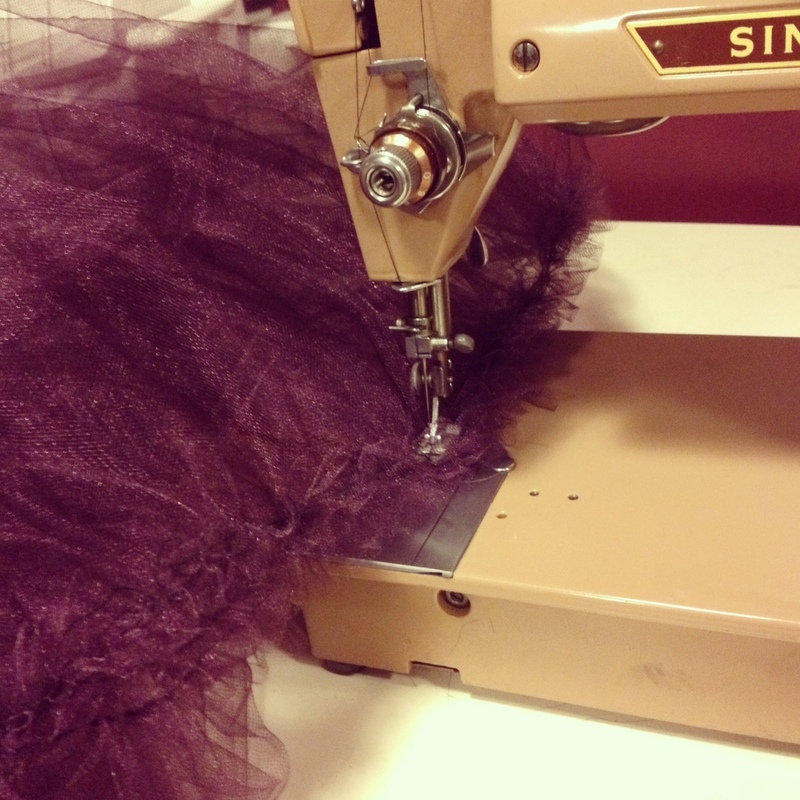 So, tulle is not that easy to work with. It sticks to everything (including itself) and comes with guaranteed static cling. But I like a challenge, maybe that's why I've done so many tutu variations, just to force myself to get good at something difficult. For this particular skirt, because Sandy asked for it to be very full and dramatic, I decided to use double the layers that I've done in the past. This one has 12 layers! 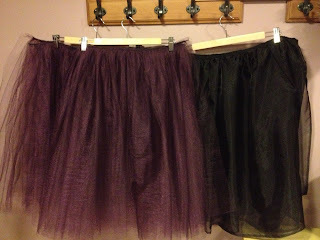 Essentially what I did was sew 3 skirts - 4 layers each, each layer was 3 yards long of tulle, shirred together. Then sew those layers together. 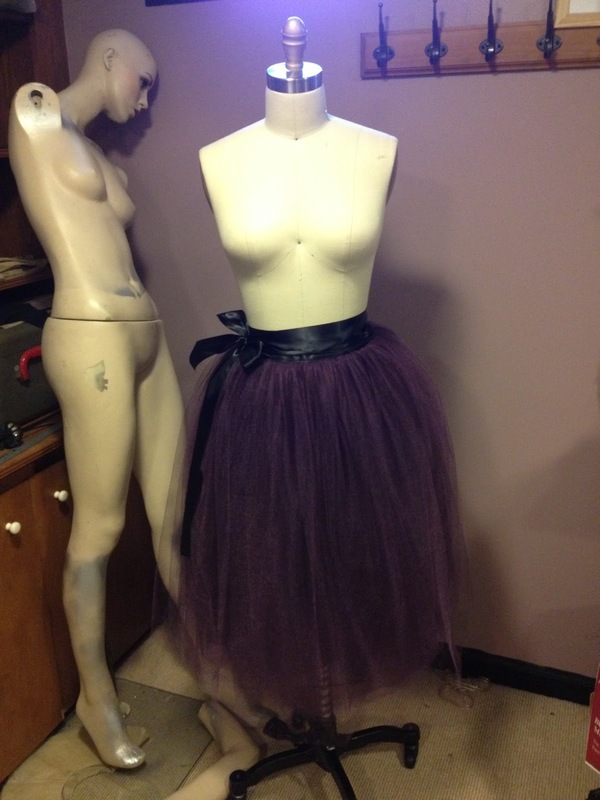 Now I don't claim this to be the "correct" way to make a tutu - the head costume designer for the New York City Ballet would probably jump all over the chance to tell me this is the wrong way to make a tutu. But I was trained in Fashion Design, not sewing or tailoring. Luckily FIT is one of the few schools that also requires you to take 2 sewing classes before you graduate if you are majoring in Fashion Design - but they can't possibly cover everything. So I do the best I can with the knowledge I have - but I am by no means an expert at tailoring or the "right" way to do everything. And, the finished product. It actually looks so much prettier in person - the tulle is a beautiful plum color that has a bit of sparkle to it. It ties with a 3'' thick double faced satin black ribbon. My studio is so dark, it's hard to get a great photo of anything down there. I drop it off to Sandy tomorrow! Hopefully she loves it. Accessories, leather, and more... for under $50?? Ahh, I've been so bad with updating! 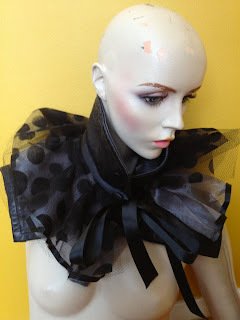 Right now I am working on adding an accessories section to my etsy site, and aiming to keep all items in this section under $50. Some of the new things to look forward to are detachable collars and peplum belts - which are perfect additions to your current wardrobe. 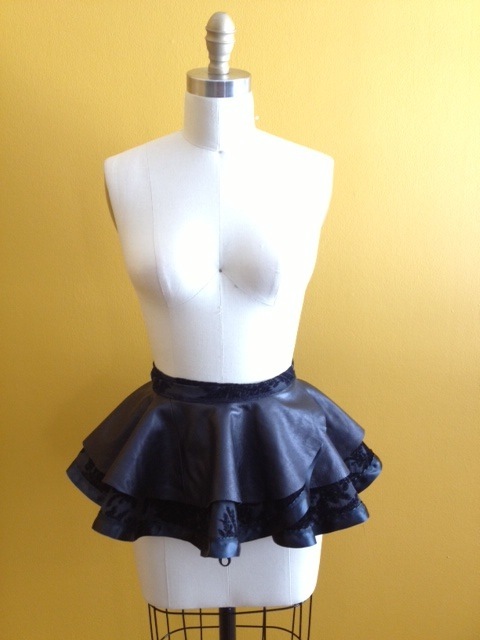 I'm also working on many special new items using recycled leather.